I muttered to myself, “Eventually all my hard work is paying off,” as I swayed on the hanging chair attached to the verandah. This chair lets you reflect thoughts as you stare at the faraway mountains. When Arjun of SOS Accelerator contacted me, I was marvelled looking at the pictures of Sylvan Villa. One of those that particularly caught my attention was that of the villa and the adjacent mountain view. Little did I know that the pictures were only half of what I was about to experience. My stay at Sylvan Villa was one of the most luxurious and amiable and I recommend this property to everyone, irrespective of where you live. On seeing the pictures, your first thoughts would be of how lush and comfy the property is to stay with your family or plan a reunion with your friends. The ideal weekend getaway villa, which is located less than an hour and a half from Chandigarh. A place that is warm, refreshing, and lets you recreate. However, Sylvan Villa is much more than just that. It’s not just a luxuriant getaway villa but also can easily disguise as your home. With the staff being extremely humble—yes, your typical Himachali people—and the regionally found veggies that turn your food from good to wow, make your stay much more than just luxurious. I stayed at Sylvan Villa for two nights and wished to extend my time. We reached the property in the evening and were welcomed with lemon mint honey tea and the pakoda platter we had ordered. When Mrs Bhavna, the owner of Sylvan, asked me to contact Mr Rasal for dinner arrangements, I never knew he was a local. When we spoke for the first time, his Himachali accent and the constant use of “Ji” after every sentence delighted me. I was looking forward to meeting Mr Rasal. Did you know? Sylvan Villa is believed to be a 100-year old property and that, it has been here since the British era? One can still feel the old world colonial charm as you move from one room to another. With antique pieces like a gramophone, charkha, old-fashioned telephone, rocking chair, one can experience the vibes of the British era at Sylvan. A lot of the decor items are archaic, thus throwing an extremely vintage aura around. You can feel it by looking at the details, not just inside the villa but in its periphery too. Also, I was taken aback when Bhavna told me Sylvan Villa was a school before–and that, it was the only school in Dharampur back then. I wonder how many giggles the property must have heard! The thoughtfully curated decor and the warm, cosy beds would make you not leave your room. The rooms additionally have a huge dressing room, which holds your luggage and gives you a vanity mirror along. The bathroom is spacious with two large washbasins and a mirror large enough to hold all your squad! There are multiple numbers of options to dine at—during harsh winter days, one can dine at the indoor seating, which is right outside the kitchen (this gives you steaming food quicker plus you can always summon the cook or Mr Rasal for extra rotis) or go upstairs and sit in the huge combined balcony. On clearer days, you can sit at the outdoor seating—which by the way is my favourite—and instantly get boosted seeing nature and experiencing the fresh air. There's another outdoor seating, which is towards the right of the villa. Or, if you're feeling extremely lazy and want to get pampered (especially on cold nights), sit in the living room, as you watch a movie or a cricket match. The last one is another favourite of mine for obvious reasons! In all, there are three bedrooms—two being on the top floor and one on the ground floor—but they're expanding the property so you'll have more rooms in the future. The top two bedrooms have a large combined balcony, which I feel is the best meeting spot before you go downstairs. You can even have breakfast on the seating or play carom and board games. I used to work in this area and when I ran out of words, I simply read a book! If you watch my Instagram stories, you would hear me talk about the hospitality at Sylvan Villa prominently. Keeping aside how beautiful the property is, the aspect I loved the most about Sylvan is the hospitality. I was so touched by the way I was treated here. The hospitality matches with that of a five-star hotel but unlike the half-interested faces there, the staff at Sylvan is so humble and sweet that they’ll easily become a part of your family during the stay. This is by far the best property I have stayed at in terms of service. Thanks to Mr Rasal—the person who looks after cleaning and maintaining the house (yes, also the one responsible for making your stay comfortable) and his wife, Mrs Sunita, who works alongside. We were given a menu card by Mrs Bhavna to order food of our choice. Since we were reaching Sylvan Villa in the late evening, we ordered mixed pakoda platter for starters and paneer do pyaza, plain paratha, dal fry, rice, Belgian chocolate ice cream for dinner. On reaching, we had a warm welcome. We were served with lemon mint honey tea and the mixed pakoda platter while we watched tv along. Everything cooked at Sylvan was so delicious. I remember closing eyes after every bite. The onions were so fresh and crunchy and the mushroom pickle—found in local markets—was extraordinary. I'd say, the food was ten on ten. Even the way the ice cream was served was commendable. For breakfast the next day, we had a large cup of passion fruit tea and a super huge sandwich each. The sandwich was so heavy that we could hardly eat the french fries and the mayo infused salad that was served alongside. Next morning for breakfast, we had mayonnaise sandwiches and a tall glass of hot coffee. 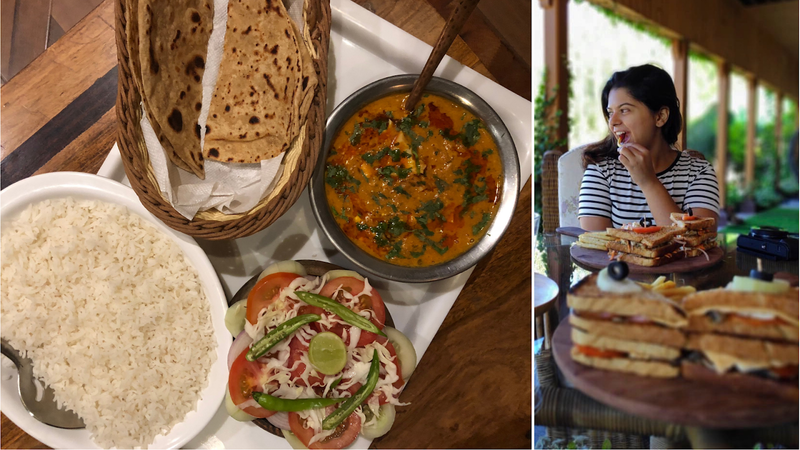 You even have options like egg omelettes, parathas, frittatas for breakfast beside the sandwiches and a lot of options for beverages. The dessert next night was Nutella banana chocolate crepe and it was so soft and delicious that it perfectly suited the weather outside. Any crepe fan would have ordered for one more, I'm darn sure. For dinner, the same night, we ordered egg curry and oh my goodness, it was so beautiful! (I can't help praising!) And, how can I forget Rajma? The dish tasted equally yummy and everyone loved it. Set on Kasauli Hills in the town of Dharampur, Sylvan Villa seems to be situated in an apt location—it is proximate to the local market and yet cut the chaos of a town living. Sylvan is located on a hill, which passes through the market. The Dharampur railway station and other basic needs are at a walk's stretch. The Dharampur railway station connects you with Shimla and Kalka (Haryana). Besides the proximity, the panoramic view from the villa along with the huge lawn in front is perfect to chill with some chai and pakoda. Manki Point/Hanuman Temple 14.2 km away – Hanuman temple is located on a hill and as you get close to it, the weather keeps on getting cold and hazy. Once you reach the top, the view below is amazing. As the name suggests, you would come across a lot of monkeys here. Also, carry your ID proof since it's a defence area. Gilbert Trail 12.8 km away – A photographer and hiker's delight, the Gilbert Trail is a must visit place, especially in monsoon. With plenty of flowers along the trail, the place has a ton of fresh air for you to revive. The stretch is about 1.5 km long. Christ Church 10.9 km away – Christ Church is a lovely place to visit after you are back from the Manki Point since the monument opens at 11:00 am. Located near the historic mall, the Christ Church has a peaceful ambience in and out. It has a ton of options to eat and shop around. Sylvan Villa has a plethora of recreational options. For family bonding, there are indoor games like carom and a lot of board games. Additionally, the lawn in the front of the villa is perfect to play cricket, football, and badminton. There are television sets with all your favourite channels. There is a portable WiFi unit, that works great outdoors—for those of you who work from home or have an important email to send. There is an easy, one hour trail that takes you from the right side of the villa and scans you through a forest of tall trees. You further reach the sight of railway track and then enter the market. Grab a can of juice as you move ahead. You'll reach the GL Public School, and then you know the route further! 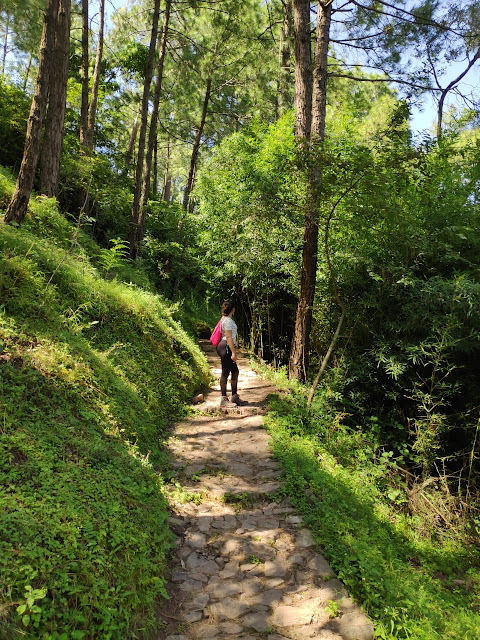 This short trail gives you an insight of the forests around these classic properties in Himachal; those forests you always looked from afar but never ventured into. You will also come across cows grazing and a few locals working. This trail does not require a guide, however, you can always request for one. So you see, Sylvan Villa is a perfect staycation for family and friends with a lot of recreational options and three large bedrooms to hold every member of your clan. It can be best enjoyed if you stay there for two to three nights. Honestly, for me, two nights was way too less, and I wanted to sleep more on the cosy beds, have more delicious food, and be more pampered by the staff. I am surely coming back here again. By road, reach the GL Public School, Dharampur (found on Google Maps). By keeping the school to your left, you'll find an off route towards your right that goes straight up to the villa. By rail, hop on the Kalka-Shimla toy train and get down at the Dharampur railway station. The villa is at a walkable distance, however, you can hire a cab too. You can even take a train to Chandigarh and hire a private cab for Dharampur. Use coupon code RUTUJA to avail Rs 1000 off!